Social media is littered with images listing what rigor is and what it is not. I personally don't like the word because it's kind of a lazy way of saying "applying what you know to understand and respond to problems." Engagement is another one of those words that is easy to understand but is becoming grayed by overuse without meaningful contexts. Thankfully, this week's #YourEduStory challenge is to show what rigor and engagement look like. But first, let's define these words. 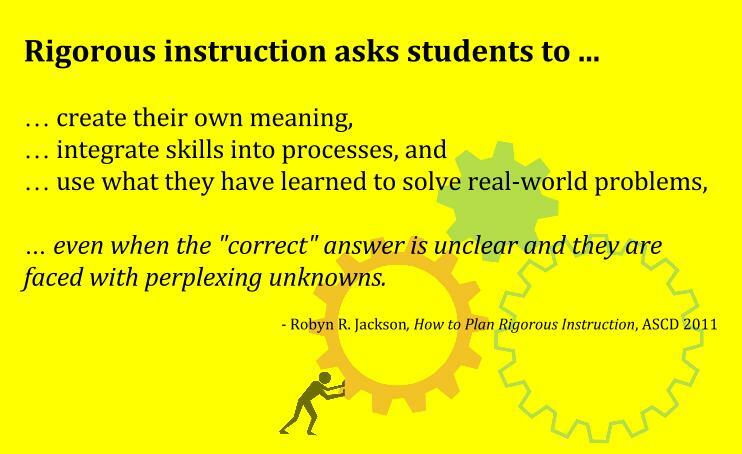 The definition of rigor below is by Robyn Jackson, and it's the best one I've found. Engagement is simple. It happens when learners are inquisitive, interested, or inspired (edglossary.org). The following is reposted from my student work blog. It shows the steps of a lesson that starts with inquiry, follows several steps that exercise targeted skills, and ends with an assessment that demonstrates historical thinking. Students completed a lot of steps to get to submitting a CCOT statement. Here's a few highlights to show what they did. Click her for the lesson plan post. The first image shows the question from last year's AP World History exam. Students wrote questions that come to mind as they begin to understand the essay prompt. Those questions were written on slips of paper (anonymously) for groups to organize and choose three to share through Google Forms. After a discussion about the questions submitted from each group, students used them as a reading guide for the textbook selection. Their note-taking task was to write as many continuities and changes that occurred throughout the given time period 1450-1750. Students wrote on continuity (white) and one change (yellow) to tack o the board (anonymously) for discussion and completion of the chart for our wall. In groups of five or six, students completed research on a given region. They were able to choose the themes as long as they had one from each of the following categories: political, economic, and social. The whole class made notes on one Google Doc. (Click link for annotated video). The last step was to practice writing four CCOT statements, each from a different region. The students submitted their best work through a Google Form.